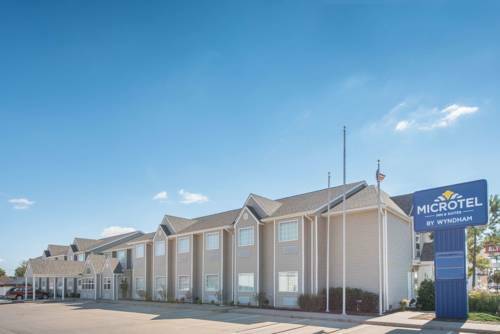 Refresh at this Microtel Inn and Suites by Wyndham Altus conveniently located on Highway 283 near Western Oklahoma State College, Altus Air Force Base, The Museum of the Western Prairie, shopping and golfing. Many local restaurants are within walking distance. Hike, boat or stroll sandy beaches at Quartz Mountain State Park, just a short drive away. Ideal for business and leisure, relax at this consistently enjoyable lodging with complimentary wireless Internet access, continental breakfast, large-vehicle parking, and complimentary 24-hour business center with computer, fax and copy services. Complimentary access to a nearby fitness center is available. Modern guest room amenities include work desk and TV. Suites, smoke-free and handicapped-accessible rooms are also available. There is no charge for children 17 and under with an adult. Marks the Quanah Parker Trail across the Texas Plains. There's also a Chief Quanah monument and a WPA-era post office mural. Museum includes display on native son and astronaut Galen Givens. When Elvis was driven from Memphis to Vegas (he hated to fly) the Trade Winds was his preferred mid-way stopping point. Room 215. 21 ft. tall arrow stuck in the ground beside the old Cottle County Jailhouse marks that Comanche chief Quanah Parker spent time in Paducah. One of a series of arrows on the Quanah Parker Trail.